In the northern part of the province of Luxemburg, on the hills around Durbuy, you will find the miniature village of Villers-Ste-Gertrude. In the heart of the town there is a beautifully renovated 17th century castle in a park of 4.5ha. In this spellbinding historic site lies the group accommodation of Le Bovet. You will feel like a Castellan when you arrive with your family, seminar or sports club. The traffic-free park has a tavern, playgrounds, an arboretum, conference infrastructure, 50km of sign-posted and documented walkways, organised activities along with advice and information about the region, mountain bike rentals and cross-country ski rentals. Together with some other buildings (like a polyvalent gymnasium) the castle is part of the domain of Villers-Ste-Gertrude, in the village with the same name. We can arrange a full program of entertainment and outdoor activities during your stay. Please contact us for more information. 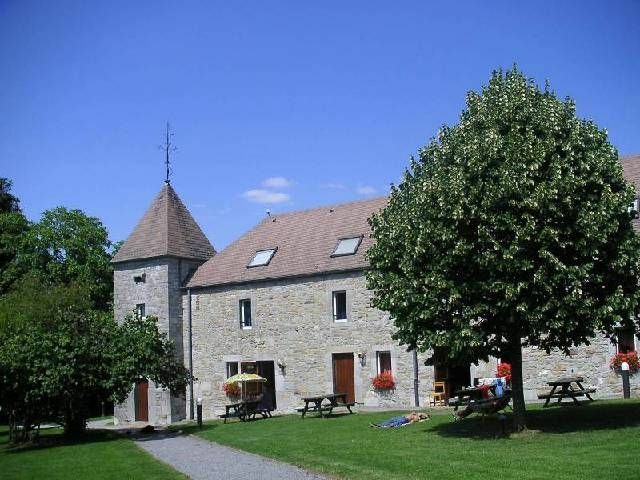 This gîte (apartment) in La Ferme consists of two floors. On the ground floor there is a living room furnished with a very comfortable couch bed (140cm); a kitchen with a vitro-ceramic cooker, fridge, coffeemaker; and a bathroom equipped with a shower and toilet. The layout of the bedroms of this property may vary. On the first floor you'll find a double bed, 2 single beds or a bunk bed. It's possible to place a cot here for another person. There is also a bathroom with a bathtub and toilet. Both the ground floor and the first floor have central heating and smoke and fire detectors. Baby beds and highchairs are available upon request. You also have a terrace with garden furniture at your disposal. Villers is part of a quiet rural village. Out of respect for the residents and other tenants, nightly noise is prohibited. All tenants are requested to be silent after 10:00pm. Groups (teenagers) that would like to spend their time partying are not allowed here. Costs for the use of electricity, water, heating, etc is €21.50 and is to be paid upon arrival. If you would like to order the hotel service it costs 12 euro per person and you will get bedsheets and your beds will be made upon arrival. You will also get soap, toilet paper and bath towels. You can also hire bed linen (6.50) and bath linen (3.50). Pets cost 4 eur per night/pet. All these costs need to be paid upon arrival. The village of Villers-Ste-Gertrude is part of the city of Durbuy, a must for those who like shopping in a medieval atmosphere. The area is known as a walkers paradise but is very good for cyclist too. Durbuy is on the border of the geographical areas of the Ardenne, Famenne and Condroz. That adds up to a wide variety of landscapes. Many attractions/activities can be found near this park including: Topiary Park (sculptured trees), Durbuy, Barvaux Labyrinth, kayaking on the Ourthe River, the dolmens and menhirs of W?ris, various golf courses, Coos' Waterfalls, the formula one circuit of Spa-Franchorchamps, the caves of Han, the euro space centre, Hare-Krishna Castle and an endless number of museums. There are also a number of theme parks, adventure grounds, citadels, local products and village feasts.